Although spiders are generally harmless, and are actually good controllers of the insect population in your home, their appearance lurking in the corners or on the walls in the house can be unnerving for some people. To rid your home of spiders, you will need to eliminate some of the most common causes for these eight-legged intruders to choose to inhabit your abode. Knowing what causes spiders to appear in a house can help you figure out a way to discourage them from hanging out and giving you the willies. If your house provides spiders with good places to hide and spin their webs to catch prey in peace, then you shouldn’t expect them to ignore a good thing. Spiders like dark, dry places with little or no traffic. Try to discourage spider inhabitation by eliminating the best places for them to be. Keep boxes that are in closets off the ground and away from walls, and make sure any boxes are taped up so that spiders can’t get inside them to play house. 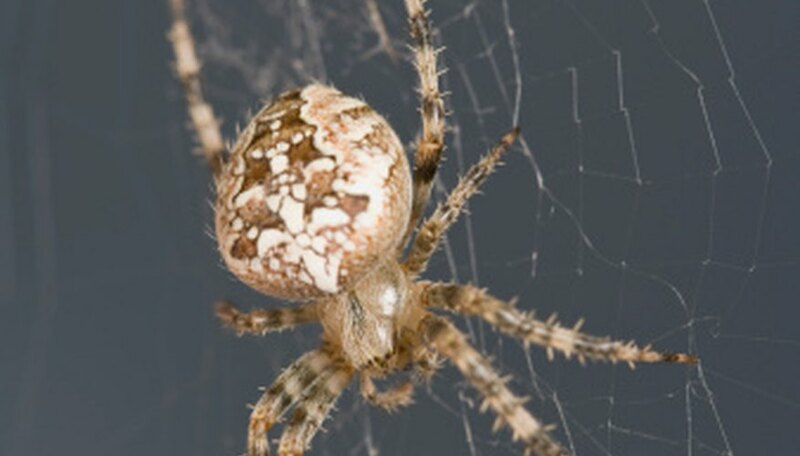 Eliminate cluttered areas that collect dust and provide nooks and crannies for spiders to make their webs and lay in wait for unsuspecting insects to get snared in their traps. Food is a key to survival for all living things, and a spider’s main food source is insects. If you have insects in your home, you can bet that spiders will be along soon to help themselves to the opportunity. Lights around windows and door openings attract bugs, and the lack of screens on open windows or doors also lets insects come and go as they please. Unfilled cracks along baseboards or around other openings can let insects into the house. All of these factors will contribute to attracting spiders inside the home to eat the insects. Preventing insects from entering, or using a pesticide to get rid of the insect population, will also drive spiders away for lack of interest. If you have never seen spiders in your home before and suddenly they are appearing in the house, then it’s possible you brought them in. You may not realize you did it, but if you have moved plants in from outside, or brought firewood or other outdoor items into the house, then it is reasonable to suspect the spiders came along for the ride. They may also be hitching a ride inside storage boxes brought in from a storage facility or a garage. Sometimes, spiders appear in the home because the homeowner has not kept the place adequately clean. Regular sweeping, dusting and vacuuming will get rid of any existing webs -- and possibly eggs for future generations. A house that is not kept clean can literally be a breeding ground for spiders.